As the head brewer at The Blue Point Brewing Company, Alan Brady brews 150 kegs a day. But he only drinks a glass or two – he’s too busy modifying brewing processes, overseeing production operations, and maintaining quality control. At 17, Brady brewed batches and batches of beer at home – so many, in fact, that he started throwing it out (“It cost me next to nothing,” he rationalized). 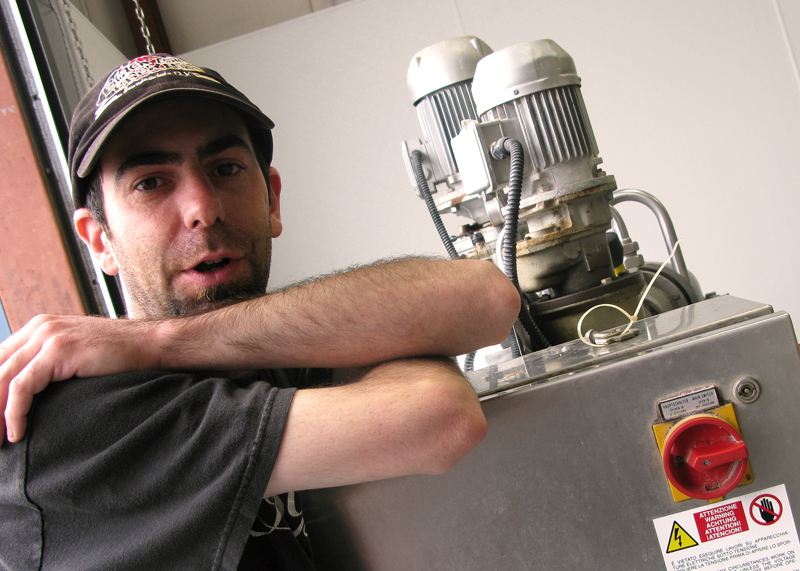 Below, Brady describes how he nailed his first brewery job, why he doesn’t believe non-beer drinkers, and his favorite toast – one that’s bound to raise eyebrows among any company. Graduated from: Nowhere. I’m a high school dropout. How he learned to brew: When I was 17, my mom and I bought my dad a homebrew beer kit for Father’s Day. I was more interested in it than he was, so I started brewing like crazy – a couple of times a week. That must have been a hit at high school parties. There’s a different responsibility when you’re making beer. It’s not something you buy at the 7-Eleven for $2, get drunk on, and have a hangover from the next day. I had a beer here and there, but it wasn’t like my friends were getting hammered all the time. 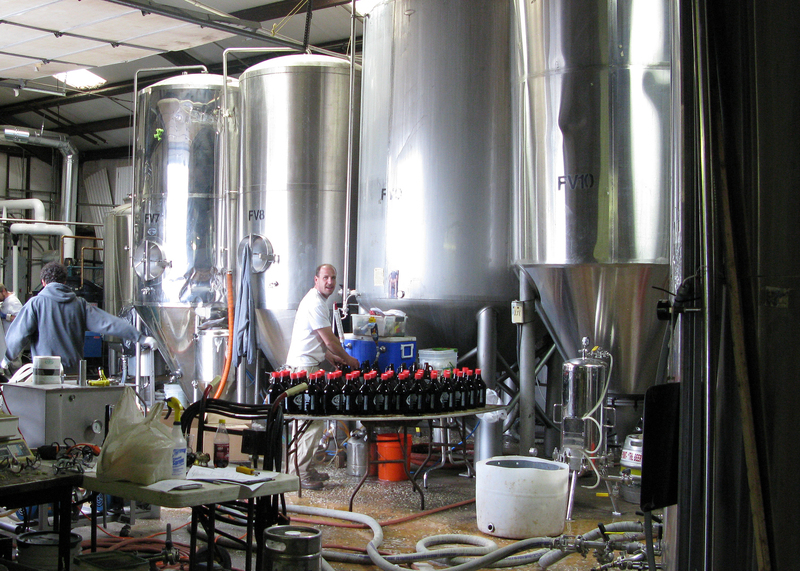 Something people don’t know about your job: Brewers don’t sit around all day and get wasted. We’re running machinery and are surrounded by dangerous chemicals and boiling hot water. First major screw-up: I was using bleach to sanitize my materials at home, and I didn’t rinse it out well enough. It affected the beer like crazy. 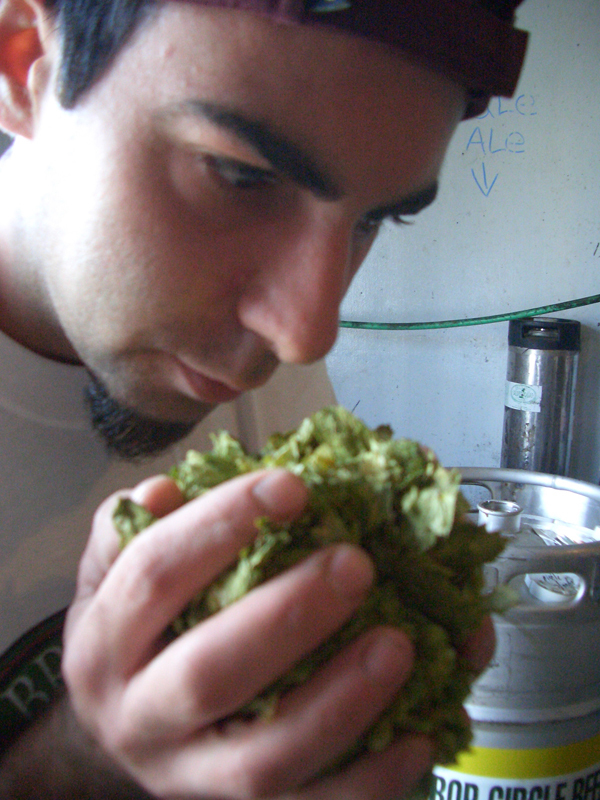 Alan Brady takes a whiff of whole leaf hops, which add bitterness and act as a natural preservative. What are the main ingredients in any beer? Water, barley, yeast, and hops. But you can combine those four ingredients in millions of different ways. Go-to beer: American pale ale. It’s one of the best beers we make. Weirdest beer ever tasted: Garlic beer and chili pepper beer. How do you develop a new recipe for a beer? I’m inspired by other beers, ingredients, and flavors – or, from a business perspective, whatever is in demand. The first batch of a new beer might not be exactly what I’m looking for, but I sit down with a notebook and analyze the taste: Is it too bitter? Too strong? What kind of ingredients inspire you? I cook a lot, so I was making a dish at home using Szechuan peppercorns. They numb your tongue, and even used to be illegal in the United States. I bought some online – after they became legal, that is – and incorporated that flavor into the beer. Going outside the box can really work. What are you brewing now? Our summer ales have been out for a few months. One of our other new beers is called No Apologies, which has a pretty high alcohol content but isn’t a real moneymaker. We brew it because it’s cool. How did you end up in Long Island? The brewery I worked at in Connecticut went out of business, and then I got laid off from a brewery in Boston. I saw that a place in Long Island [Blue Point Brewing Company] was hiring, and have been here ever since. How did you stand out during job interviews? When I was brewing at home, I had all the freedom in the world. I made a concoction of Canadian lager, apple cider, and a bunch of spare ingredients – like plum extract and apricot extract. It was actually pretty good, so I bottled it and brought it to my first interview. 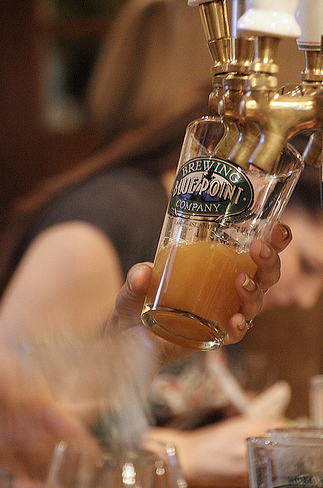 Pros of brewing in Long Island: The brewing scene is blowing up here right now. We helped pave the way with that. Cons of brewing in LI: There’s no manufacturing here, and utilities are very expensive. Best part of the job: Our tasting room, which is open a few days a week. After sweating and cursing at broken machinery, I’ll enjoy a brew in the tasting room with a customer who really appreciates our work. Worst part of the job: The stress – we’re growing extremely rapidly. Do you get tipsy on the job? I’ll usually have a beer before I leave work, but that’s it. Even though I get free beer, you can’t just drink it endlessly. I know people who would beg to differ, but I digress. Where does the name Blue Point originate? It’s the town over from our brewery. The owners, Mark Burford and Pete Cotter, lived there and homebrewed before opening up shop. By using the town’s name, they were also trying to cash in on the world-famous bluepoint oysters. How much beer do you brew each day? 150 kegs. What beers should all beer-drinkers try at some point? All my beers. [Laughs.] There’s some funky stuff out there, like Belgian beers brewed with certain bacteria that makes them super-sour. Or beers brewed with wild yeast instead of cultivated yeast. What about people who don’t like beer? I don’t want to hear that someone doesn’t like beer because they don’t like Budweiser. They just haven’t found the right one. Read the labels on bottles, so you can learn what you like and what you don’t. Where is your favorite spot in the world for craft brews? These days, the U.S. is on top of the game. In Europe, brewing is very traditional – they stay away from new styles, which we embrace. Favorite toast: I knew a guy from Colorado who would always scream, “Sore unipa!” when making a toast. When I finally asked him what it meant, he told me it’s said in [the video game] Mortal Kombat, when players attack each other. So now I’ll sometimes say sore unipa – which means absolutely nothing – or simply cheers. From beer to career: Alan Brady shares what’s on tap. Make beer on your own as a way to get your foot in the door. It’s tough, because everyone wants to brew, but there are only so many jobs. During interviews, I can’t stress the importance of a good handshake, paying attention, and communicating a strong work ethic. Brewing is unique because it incorporates biology, microbiology, chemistry, physics, cooking, and refrigeration – so it can help to have a background in science. Follow The Blue Point Brewing Company on Twitter at @BluePointBrewer, check out its Facebook fan page, and salivate over its selection of more than 15 microbrews. For exclusive behind-the-scenes coverage inside the brewery, visit exclusive photos on the No Joe Schmo Facebook page. This entry was posted in Cool jobs, Facebook exclusives, Foodie Fridays and tagged alan brady, blue point brewing company, home brewing, mark burford, no apologies, pale ale, pete cotter by Megan Hess. Bookmark the permalink.